1. Download comps from the thumbnail view in searches or folders. To download a comp from the thumbnail view, simply hover over the thumbnail and you will see the option to download, as shown in the image below. 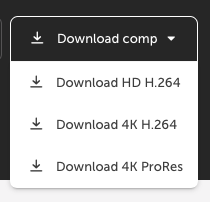 This option automatically downloads the HD H.264 comp. If the clip is not offered in HD H.264, it will download the available resolution in the available format. 2. Download comps from the product view page. This option allows you to choose which resolution and format to download, where available, from the product view page. 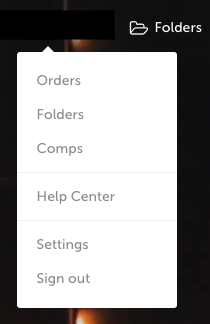 Click the "Download comp" button and a drop down menu with options will appear.